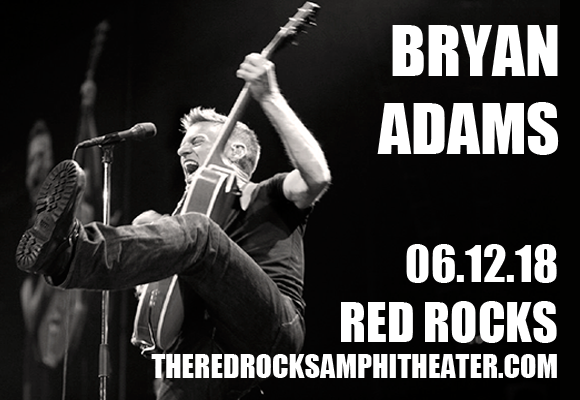 Legendary Canadian rock star Bryan Adams brings The Ultimate Tour to Red Rocks Amphitheater on Tuesday 12th June 2018! The "Summer of '69" singer is on the road to support the release of his brand new compilation album Ultimate, which features fan favorites like "(Everything I Do) I Do It for You" as well as two new hits! Don't miss your chance to see this icon at one of the world's most beautiful venues! In the four decades he has been performing, Canadian singer, guitarist, songwriter, photographer, and activist Bryan Adams has sold 100 million records and singles worldwide, making him one of the world's best-selling artists of all time. Adams rose to fame with his 1983 debut album Cuts Like a Knife, cementing his popularity with his follow-up Reckless (1984), which produced some of his best known songs including "Run to You" and "Summer of '69". Throughout his career, Adams has won many awards, including 20 Juno Awards among 56 nominations, 15 Grammy Award nominations (including a win for Best Song Written Specifically for a Motion Picture or Television in 1992), as well as MTV, ASCAP, American Music awards, three Ivor Novello Awards for song composition, five nominations for Golden Globe Awards and three nominations for Academy Awards for his songwriting for films. His 1991 single "(Everything I Do) I Do It for You", from the film Robin Hood Prince of Thieves, is one of the best-selling singles of all time.